Former PM not ruling out possibility of returning to politics and taking on Netanyahu. Likud: The public kicked him out. Former prime minister Ehud Barak said on Monday he does not rule out the possibility of a return to politics and even of heading a leftist bloc against Prime Minister Binyamin Netanyahu. "If a bloc of parties is formed in the center-left camp, headed by a man who can win elections and lead the country, it will win the elections. It is important to me that this bloc be established - of course I can lead it, I have already led an election victory over Netanyahu, but I must not turn myself into a condition for the establishment of the bloc," Barak said in an interview with Hadashot TV. He added that "party leaders must give up the ego and at least at the point of entry to take into account the possibility that they will not lead this bloc." "There is definitely an option for me to join - but me not alone is not enough. 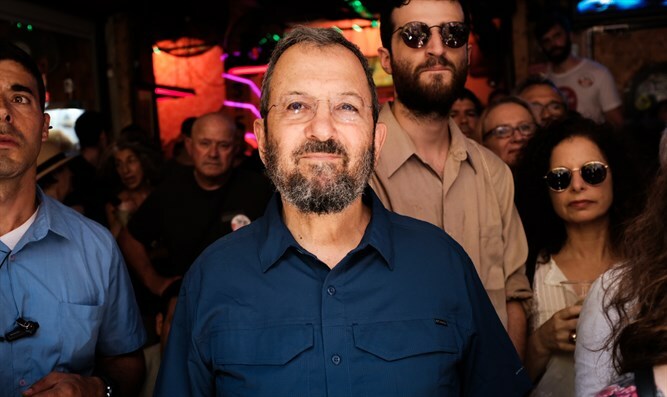 We must establish a group of parties - Labor, Hatnua, the new parties of Gantz and Ya'alon and other bodies – and together the revolution in Israel will be achieved," continued Barak. The Likud responded by saying, "The Israeli public rightly kicked Ehud Barak out with a one-way ticket. The most failed prime minister in Israel's history will watch the upcoming elections on television." Barak’s remarks followed a vote by the coalition leaders to dissolve the Knesset and go to early elections this coming spring. The elections will be held on April 9, 2019. The decision was reached after Prime Minister Binyamin Netanyahu convened party leaders from his narrow ruling coalition in a last-ditch effort to chart a path forward for a crucial haredi draft bill, aimed at preserving draft deferments for full-time yeshiva students, while imposing financial sanctions on yeshivas which fail to meet enlistment quotas. The bill would largely retain open-ended draft deferments, while pressuring the haredi sector to increase the number of haredi enlistees. The Yisrael Beytenu and Yesh Atid parties, which had both backed the bill initially, said Monday that they would vote against it in the bill’s second reading in the Knesset. With haredi lawmakers opposed to the bill, the government was counting on support from Yisrael Beytenu and Yesh Atid to pass the law ahead of the January 15 deadline imposed by the Supreme Court.